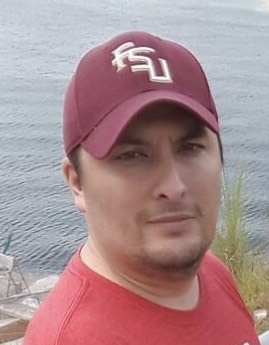 James Allen Miller Jr., 39, of Whiteland, passed away Thursday, January 24, 2019, surrounded by his loving family after losing his fight to brain cancer. He was born to James Allen and Eva (Pena) Miller on December 19, 1979 in Harford, Maryland. James worked as a technician for Honer APG. He was a fan of the Florida State football team. He loved playing football and reading Archie comics. James loved watching NASCAR racing and going to car shows. James was a sound man at his church. His faithfulness and loyalty to his church was a large part of his life. James is survived by his mother, Eva Miller of Whiteland; his sister, Vanessa (Carl) Froelich of Greenwood; several aunts and uncles; and many cousins. James was preceded in death by his father, James Allen Miller; his paternal grandparents, Horace and Elsie Miller; his maternal grandfather, Jose Pena; and his uncle, Fidel Pena. A visitation will be Monday, January 28th from 5 p.m. to 8 p.m. at Jessen Funeral Home, 729 N. U.S. Hwy 31, Whiteland, IN 46184. A service will be Tuesday, January 29th at 1 p.m. at Pilgrim Holiness Church, 1000 Hospital Rd., Franklin, IN 46131. Burial will be at International Ordinance of Odd Fellows Cemetery, Waverly.